It blows my mind that a select section of fandom is unhappy with The Last Jedi, because Rian Johnson’s film does exactly what people criticised The Force Awakens for not doing. Whilst J.J. Abrams’ film was a wonderful course correction for the franchise, it rehashed a lot from the original trilogy (keeping in mind that, back in the day, people complained about Return of the Jedi rehashing that which had come before.) Now we have people complaining that Johnson’s film upends too much of that which has come before. Are you kidding me?! That is exactly the kind of shot in the arm Star Wars needs! Keeping this as spoiler-free as possible, The Last Jedi sees the Resistance on the back foot as the First Order bears down on them. Meanwhile, on remote island, Rey is standing before Luke Skywalker, offering his lightsabre as we saw in the closing moments of The Force Awakens. Johnson also explores the concept of the Force with much more depth than we’ve seen before. Here, it’s seen as mysterious, powerful and impossible to control – even terrifying. The film continues Rogue One‘s endeavours to inject shades of grey into the franchise, rather than the traditional good-versus-evil dichotomy. In fact, the only missteps for me were some of the comedic beats, which seemed badly directed, rather than badly conceived. And now that I think about it, neither Brick nor Looper were known for their punchlines. The film also regularly telegraphs what’s going to happen about a minute in advance, which annoyed me a little. Other than these two things, there was one scene in particular which I didn’t enjoy – and which I won’t spoil – but it went for all of 2.5 minutes, which is a drop in the ocean when you consider the running time. …and at 2.5 hours, I can’t say that it needed to be that long. But at the same time, I was never bored. You could argue that the film still feels like a bit of an OT remix – something the franchise momentarily escaped with the messy Rogue One – but there are so many Significant Events here that you couldn’t possibly say the film was playing it safe. All of the returning cast knock it out of the park – I am consistently stunned by John Boyega’s ability to completely lose himself in the moment – whilst the new characters make their mark also. 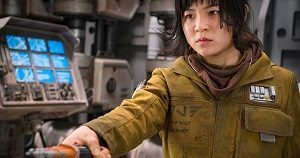 Laura Dern makes an incredible impact as a secondary character, whilst new star-in-the-making Kelly Marie Tran is an invaluable addition to the ensemble as Rose. 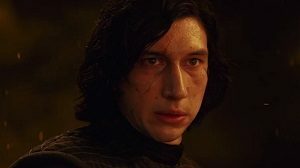 Abrams said that he deliberately left the dangling plot threads from The Force Awakens for the next director to take where they wished, and I like the fact that these movies feel like they’re taking it one step at a time. I’m not naïve about this; I have no doubt that Kathleen Kennedy et. al. have a multi-year plan, but this is exactly how The Empire Strikes Back burst onto the scene. Despite Lucas’ revisionist suggestions over the years that everything was planned in advance, that simply wasn’t the case. And in case people have forgotten, Empire received somewhat of a backlash back in 1980, mostly for being too dark, and feeling like it didn’t have a proper ending. We now know better. 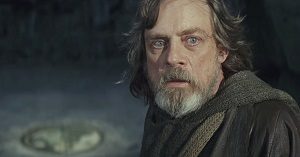 The Last Jedi hasn’t received exactly the same criticisms, but I do think that, like Empire, it will become a favourite over time for all the risks it took. I’ll say it again: this is exactly what Star Wars needed. This entry was posted in Film Reviews and tagged Action/Adventure, Fantasy, Science Fiction by Stuart Wilson. Bookmark the permalink.